Last year, I put together a collection of repurposed and upcycled DIY Christmas ornaments– because who doesn’t love creating fun and unusual ornaments for their tree? Well, I feel the same way about upcycled Christmas wreath ideas…incorporating vintage or whimsical elements to give your door festive character! 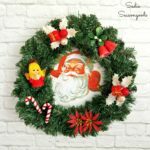 And while DIY wreaths are fun no matter what time of year, I just have a special soft spot in my heart for the winter holiday kind- our bright red door probably has something to do with that! There are limitless upcycled Christmas wreath ideas out there, using any number of thrift store finds, vintage treasures, or other unexpected materials that can hang from a door. From barrel rings, to clothespin bags…recycled plastic to old Christmas cards, and everything in between. 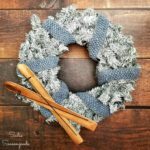 So, to get your holiday craft juices flowing, I’ve assembled some of the best upcycled Christmas wreath ideas around- get it? A round? Ok, no more punny puns…onto the repurposed Christmas wreaths! So, which Christmas wreath ideas are your favorites? Let me know in the comments if you’ll be creating some door décor this holiday season! I’ll let you in on a little secret- I have a fun new upcycled wreath project that will be posted on the blog very soon. And I guarantee that you won’t see this one coming- it’s perhaps my most unusual one yet, but you know what? I think it’s completely charming! 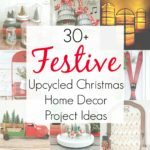 Please enjoy my full collection of repurposed Christmas projects here if you want some festive inspiration! I have a soft spot for shutters, so I love that one. But I also like the ones with jello molds and cookie cutters. Thank goodness I have more than one place I hang wreaths! Thanks for the inspiration!! You are so very welcome, Lois! When Insaw the door tags Inthought they were ceiling fan blades!….Not a bad idea!! You could totally do that with fan blades- I saw a fall version (“Give” and “Thanks”) on a pair of fan blades and it looked perfect! These are all super neat! I especially like the big bulb wreath. I’ll have to keep my eyes peeled for vintage bulbs like that!!! Thanks so much- I love that one, too! Really great article and some interesting ideas! Thanks for including my junk Christmas Wreath in your round-up. Thank you for bringing such a nice selection together for us! I liked TOO many of them. the flannel wrapped one, the snow shoe, the embroidery hoop with cream sweater, the light bulb one, the Jello/cake mold one, the ceiling medallion, and the cake pan one were my faves. I tend to make artificial green ones with pointsetttias, picks, and a bow so it was good to see “outside the box.” Want to make one with a picture frame someday/ Have 5 homemade ones drying outside made from house ivy waiting for inspiration; ya gotta love it. How many times do you get to combine needed yard work, arm exercise, craft preparation, and economy (I won’t have to buy grapevine wreathes) at the same time!!! I also love springtime ones with faux birds, nests with eggs, and apple/ dogwood or forsythia blossoms. Love these ideas! Already working on your mason jar lid Christmas ornaments! It’s so hard to pick a favorite, they are all wonderful! Loving these so much that I have to scroll back up and take a second look. Thanks for including my silver platter in your line up! Great round up! Thanks for sharing at Vintage Charm! Me, too- so many fun ideas. Thank you!